Dr. Glezer began at Tech in 1992 as an Associate Professor. He was named to the Woodruff Chair in Thermal Systems in 2002. Prior, he was an Assistant and Associate Professor at the University of Arizona. A free jet driven at 600 psig into a vacuum. 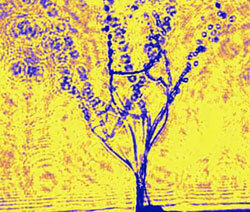 The branching is caused by the vacuum. Professor Glezer's research interests focus on the manipulation and control of shear flows in a broad range of applications, including reacting and nonreacting mixing processes, enhancement of the aerodynamic performance of airborne and underwater vehicles, small-scale combustion-driven power systems, jet thrust vectoring and noise reduction, fluidic-driven heat transfer with an emphasis on electronic cooling, fluid atomization, and the development of novel fluidic actuator technologies including microelectromechanical systems based (MEMS) actuators. His current research projects include the development of a centimeter-scale reciprocating pulse-bombustion-driven MEMS-based microgenerator to replace batteries in portable electronic hardware; the demonstration of robust micromachined jet actuators technology and its application in unmanned airborne vehicles or micro-unmanned airborne vehicle platforms; aerodynamic modification of lifting surfaces of a class of unmanned airborne vehicles; the direct, small-scale control of fuel-air mixing in a "smart" highperformance turbine; thermal management in electronic packaging using fluidic forced convection heat transfer; optical phase correction in free shear flows using neural networks, optoelectronic image processing, and global optical flow diagnostics; heat transfer enhancement in a thermally-driven boundary layer along a heated surface; fluid mechanics of the through-hole plating of printed circuit boards; and vibration-induced fluid atomization for two-phase cooling and coating applications. The research is conducted in the Fluid Mechanics Research Laboratory at the Woodruff School of Mechanical Engineering. 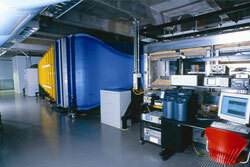 The 2500 square foot laboratory is equipped with state-of-the-art facilities and diagnostic tools including a low-speed, high-quality wind tunnel, several small-scale wind tunnels developed for laser Doppler velocimetry and particle image velocimetry based diagnostics, a closed-return water mixing facility, several low-speed air jet facilities, a 300-gallon water tank, a two-component fiber-based laser Doppler velocimetry, two positive image velocimeter systems, multichannel hot wire anemometers, a high-speed video imager, and a laser system for measurements of scalar concentration fields. Professor Glezer's research is sponsored by the Air Force Office of Scientific Research, the Defense Advanced Research Projects Agency, the Army Research Office, the National Aeronautics and Space Administration, the National Science Foundation, AMCOM, and private industry. J. M. Wiltse and A. Glezer. 2004. Scalar Mixing in a Forced Nonreactive Plane Shear Layer using a Thermal Analogue to Species Concentration. Journal of Fluid Mechanics, 506, 369-406. A. J. James, et al. 2003. Vibration-Induced Droplet Atomization. Journal of Fluid Mechanics 476, 1-28. B. L. Smith and A. Glezer. 2002. Jet Vectoring using Synthetic Jets, Journal of Fluid Mechanics 458, 1-34. M. A. Trautman and A. Glezer. 2002. The Evolution of Streamwise Vortices in a Forced Natural Convection Boundary Layer over a Heated, Inclined Plate. Journal of Fluid Mechanics 470, 31-61. A. Glezer and M. Amitay. 2002. Synthetic Jets. Annual Review of Fluid Mechanics 24.